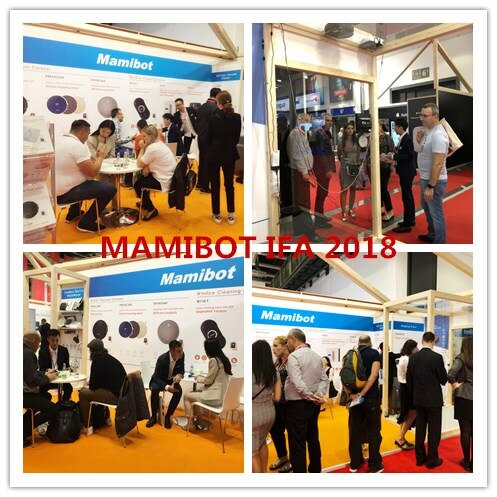 Mamibot presented lots of models, eyecatching big attention from professionals, journalists and end users on 2018 Berlin IFA show. The robot window cleaner iGLASSBOT W120-T was awarded as “the 10 best smart devices of IFA 2018”. Except for W120-T, Mamibot has also other hot selling models with quite massive selling points and affordable prices. During and after the show, Mamibot signed agreements with its partners with total value more than 1.2 million USD. Below I would like to share with you part of our hot selling models, which may bring great value and profit to your business in the next 1-2 years. MAMIBOT W120-T robot window cleaner: one of the 10 best smart devices of IFA2018. Auto cleaning robot window cleaner with APP control, stylish design, reliable quality and performance, and affordable cost. MAMIBOT W110-T robot window cleaner: stylish design robot window cleaner, different cleaning pattern comparing with W120-T, APP control, reliable quality and performance, very affordable cost. Mamibot EXVAC660 hybrid robot vacuum cleaner: the best gyroscope navigating robot vacuum cleaner, APP control, mapping system, Auto cleaning, auto charging, wet mopping, dry cleaning, etc. Mamibot UVLITE100 dust mite allergy vacuum cleaner: the best designed cordless dust mite vacuum, with luxury design, super common price, UV sterlizing. Mamibot MOPA580 multifunction cordless electric mop/polisher: the best selling model in China, UK, USA among similar products. Polishing/scrubing/mopping/waxing integrated. Mamibot ProVac PLus/Plus2: the very competitive entry-level robot cleaners, bigger suction power, less than 38USD/pcs price, long working time, priority promotional gift. If you are in cleaning device industry, you must have realized that the cleaning robots are playing one important role in our life, the robot cleaners are entering millions of families, however only less than 5% of worldwide families owe this type of product averagely. There is HUGE potential! It is not too late if you have not started yet, but in two years later there will be few place for new players, and we expect that within 5 years the robot cleaners will be as common as TVs, Refragirators, or Micro-wave owens in our daily life. Should you have any interest in any of our models, please feel free to let me know. I am more than happy to support.